The typical container used for holy oil. When the oil burns, no angel can touch or pass through the flames, or he dies. 2.17 11.09 O Brother Where Art Thou? 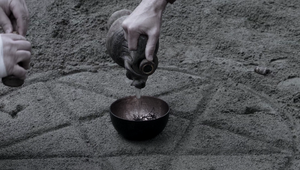 Holy oil is a rare substance that Castiel obtains from Jerusalem in order to use it to restrain Raphael. When the oil is ignited, its flames will trap angels and archangels; if an angel touches or attempts to pass through the flames they will die. While any angel will die from trying to cross the circle, being attacked with it won't kill archangels, however it can banish them, as seen with Michael. 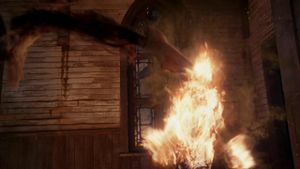 Sam describes it as "a devil's trap for angels" but it differs because angels can still use some of their powers while trapped within the flames. Sam and Dean keep bottles of the oil in the trunk of the Impala, each of which was presumably supplied by Castiel. 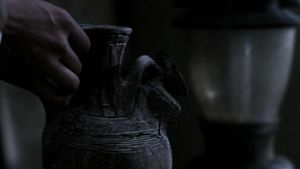 It is also discovered that holy oil is one of the components needed in order to see hellhounds. Dean scorches two pairs of glasses in holy oil fire. Holy fire is capable of hurting, though not killing, demons. 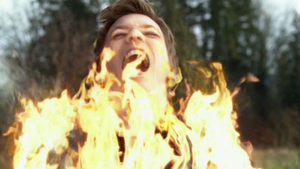 Castiel throws Meg onto a ring of holy fire to escape and Sam douses Abaddon in holy oil and sets her on fire. Neither is killed, but Abaddon is left in so much pain she abandons her meatsuit and flees. However, a dissatisfied demon is able to use it to commit suicide to make a point to Crowley. Sam discovers that holy fire can be used for biblical purification. This makes it a viable cure to the rabid infection started by the Darkness. 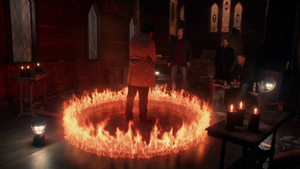 Castiel and Dean trap the archangel Raphael inside a ring of burning holy oil and ask him for God's location. He claims that God is dead, and refuses to cooperate. They leave him in the still-burning circle. He eventually escapes. 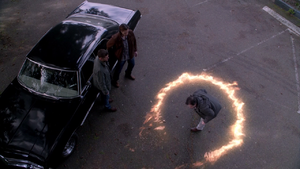 Sam and Dean use it to trap the Trickster, forcing him to reveal that he is actually the archangel Gabriel. Dean releases him by turning on the fire sprinklers. 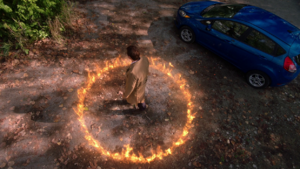 Lucifer uses it to trap Castiel, but he manages to break the circle and escape by throwing Meg on the flames. The extent of her injuries are unclear, but she survives. Castiel – with a cry of "Hey assbutt!" – uses a Molotov cocktail of holy oil to momentarily banish Michael. Dean traps the angel Balthazar in a circle of holy oil and forces him to return the soul he bought from a boy, Aaron Birch, with a piece of the Staff of Moses. 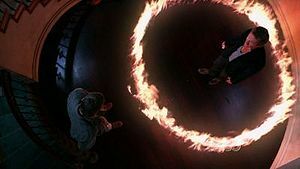 Castiel causes the circle to vanish with a gesture when he wishes to free the angel. 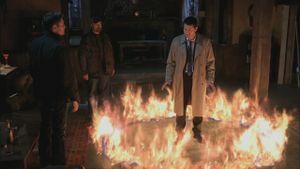 Dean, Sam, and Bobby trap Castiel in a circle of ignited holy oil and force him to admit to working with Crowley. Castiel tells them to leave him when the sound of an approaching storm of Demons is heard. They leave, and only Crowley enters; he causes the circle to vanish with a gesture, freeing the angel. Searching the demon tablet for a way to see hellhounds, Kevin Tran finds out that an object scorched by holy fire can be used to view them. Dean ends up scorching two pairs of glasses with holy fire which allows him and Sam to see Crowley's hellhound and kill it. Abaddon is doused with holy oil and set aflame by Sam, forcing her to abandon her meatsuit Josie Sands. 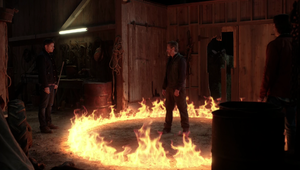 After coming to Dean's aid Ezekiel is trapped in a circle of holy fire and passes out, allowing Dean to size him up on his intentions. 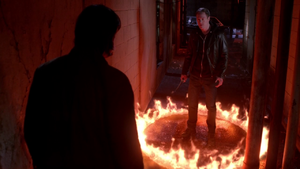 Sam and Dean lure Gadreel, trapping him in a ring of holy fire. 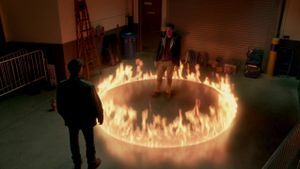 Metatron plays along with Sam and Dean, allowing himself to be trapped in a ring of holy fire before extinguishing the flames. He mentions that when using it to cook s'mores, the holy fire gives them "a delightful minty aftertaste." Sam and Castiel find the angel Josiah, badly burned by holy fire. After falling for the trap laid out by Metatron, Josiah was doused with holy oil and set aflame by a flame thrower hanging over the entrance to what he thought was a doorway to Heaven. 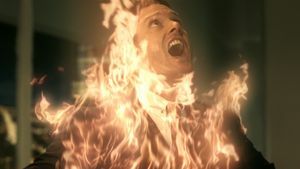 In protest of the way that Crowley has been running Hell, a demon douses himself in holy oil and self-immolates in front of Crowley. 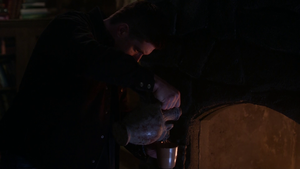 When preparing to destroy the Book of the Damned, Dean adds holy oil to the fire. However, Sam only pretends to burn the book. 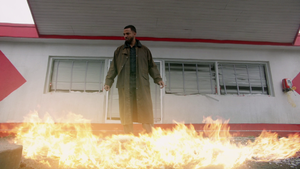 Dean is shown throwing a container of holy oil into his duffel bag when he is getting weapons out of the Impala's trunk. After Billie tells Sam that he is "unclean in a biblical sense" due to his rabid infection, Sam comes up with the idea of using a biblical purification as a cure and searches the Bible online for such a purification. He finds indicators that holy fire can be used for the purpose and douses a sponge in holy fire before using it on himself. The holy fire burns away the rabid infection and cures him. Now with a viable cure for the rabids, Sam lures a group of three into the hospital chapel where he traps them in a ring of holy fire. Proximity to the holy fire causes the rabid infection to burn away and the people to regain their humanity. Sam then recruits the people to use the holy fire cure on the remaining people of the town. 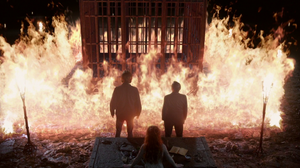 During Rowena's summoning of Lucifer in Hell, the holding cell that is to hold Lucifer is encircled by holy fire. Sam, Dean, Crowley, and Rowena summon and trap Lucifer in a ring of holy fire in an attempt to get Castiel to expel him from the vessel. Sam, Dean, and Mary trap Ramiel in a ring of holy fire in an attempt to get him to cure Castiel. However, Ramiel is able to extinguish the flames with the use of the Lance of Michael. After learning that the British Men of Letters possess the Colt but no bullets, Sam tells Mick Davies that to make new bullets for the gun he needs to create a tincture of holy oil, sage, and myrrh, coat a silver bullet in it, and perform a spell. Holy oil is one of the key ingredients in the spell Crowley uses to close the tear in space and time to the alternate universe. To protect his vault, Luther Shrike uses silver-tipped darts filled with arsenic, holy water, and holy oil. While fighting a possessed giant dinosaur plushie, Dean doses it with holy oil and sets it aflame, destroying it. When Michael suddenly appears at a gas station, Dean, Sam, and Castiel flee outside. 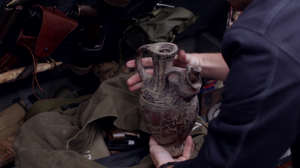 Dean goes to the trunk of the Impala and uses their holy oil container to create a Molotov which he throws in front of Michael, preventing him from advancing on them. An Apocalypse World hunter shows Mary bullets coated in holy oil, among the various assortment of specialty bullets. When going to meet the shaman Sergei, Castiel accidentally steps into a ring a of holy fire, a precaution set by Sergei for his own self-preservation. As Michael has Sam, Jack and Cas at his mercy, Sam throws a Molotov of holy oil at him, distracting him long enough for Castiel to put the angel cuffs on him. This page was last edited on 20 January 2019, at 02:40.